Morning ladies, for this month's collaboration with Marks & Spencer I thought we'd look at wardrobe 'must haves'. Timeless pieces that can be styled multiple ways & will last the test of time, as after all I don't know about you but as much as I love fashion & the latest trends the more I think about what I enjoy wearing it's those timeless classics with just a hint of the latest trends. 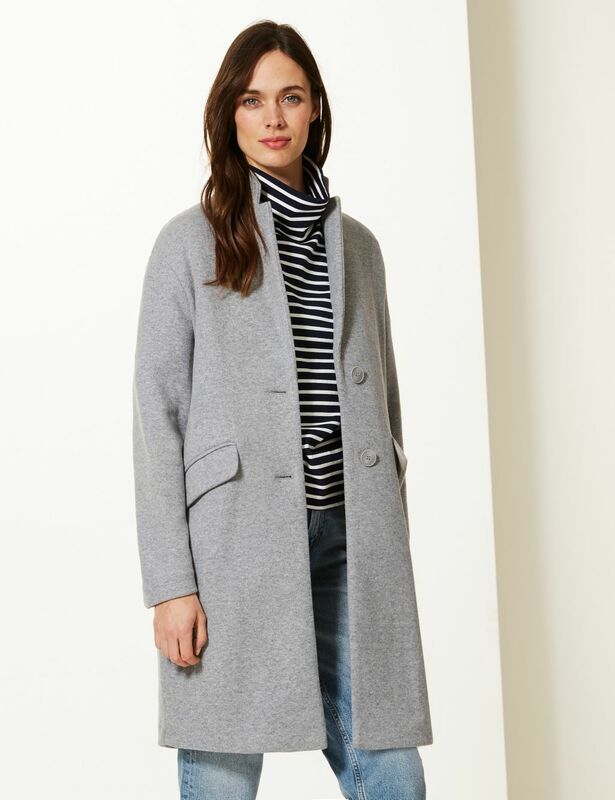 So let's get started with a coat that's both effortless & timeless. I love the above single breasted one. The colour for all us grey lovers is spot on & so is the style. If like me you have a weakness for a blazer then this is just a warmer equivalent & it's so easy to style. For casual weekend style I love how it's been styled in the above image - a breton such as this one, relaxed fit jeans like these & trainers, such as these. Then for the office cigarette pants like these teamed with a stylish top, such as this one & these shoes. Similarly it would fab styled with this dress & these boots. 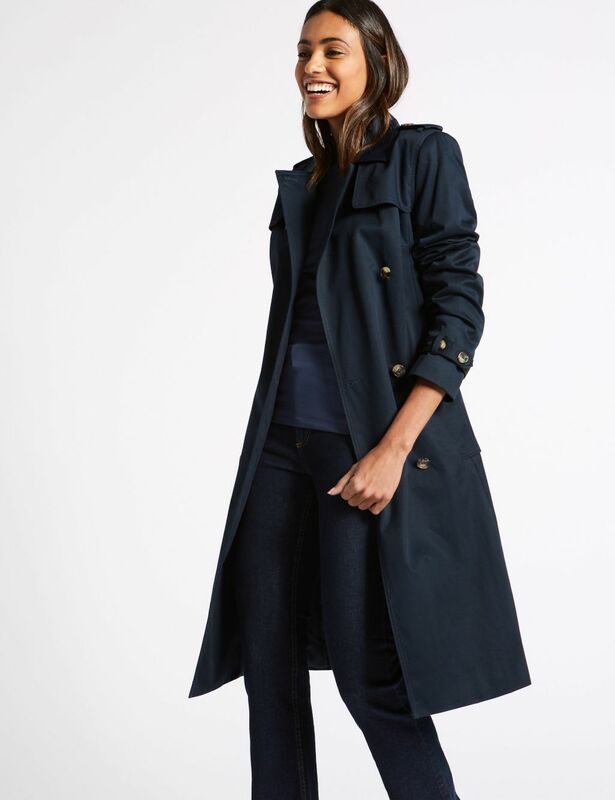 Another classic has to be a trench & whilst a beige trench is the ultimate timeless piece I have, over recent months found myself drawn to a navy version. In terms of style the more classic the better. The one above looks ideal & comes in both navy & a gorgeous deep golden shade of beige plus it's also actually weather resistant with Marks' Stormwear technology so stylish & practical. Again this is ideal for styling similarly to my suggestions for the single breasted coat. Equally a pleated skirt like this one paired with this sweatshirt & these ballet pumps would look fab. 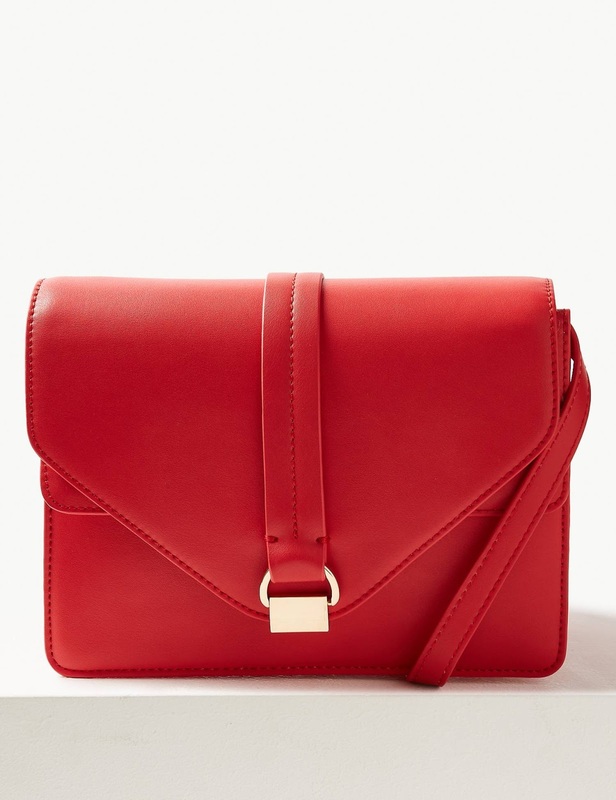 You will know by now how I love adding a pop of red to a lot of my looks, so a red cross body bag such as the one above will soon become a 'go to' item & would be a great finishing piece to most of the pieces I've picked out today, together with the outfit suggestions I've made. However, if you prefer something a little bigger then take a peek at this stylish tote. Moving onto tops next & a statement crew neck is ideal for adding a little interest to your wardrobe. Whether it be styled with cigarette pants, such as these with these ballerinas or dressed down with jeans, such as these & these trainers. 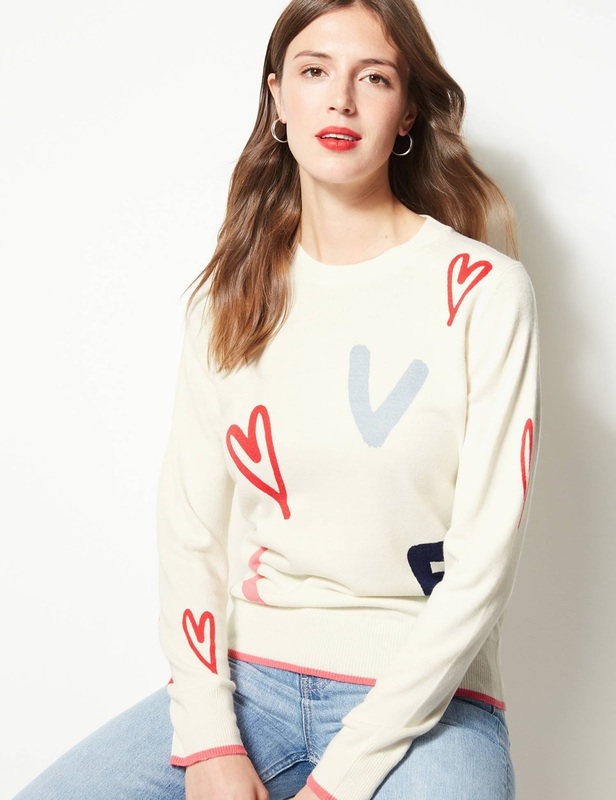 It probably won't come as any surprise to see I've included a stripe sweatshirt in the list. Pattern clash with a leopard print belt, like this one & jeans like these & these ankle boots for the perfect look. This season I've really got into my oversized chunky knitwear & this longline cardigan is great piece for dressing up or down. Wear over a dress, such as this one & finish with this belt & these boots or team with a longline white shirt, such as this one & wear with leather leggings like these & these trainers. Moving onto jeans next & a great multi purpose style is a relaxed fit slim leg jean that's slightly cropped. Perfect for wearing with trainers & ballerinas as much as it is with ankle boots or heels for a night out. If you love the idea of a boyfriend fit but always feel they look too relaxed/casual then try a relaxed slim leg, which is far more flattering. The ones above come in 3 different lengths & 2 shades of blue, the ones featured above & a slightly lighter shade that would look great teamed with a pretty white blouse come the warmer weather. Not only a timeless style a slightly cropped relaxed fit straight leg trouser is another great wardrobe staple. Which can be styled exactly the same as you would cigarette pants but can equally be dressed down with an oversized cashmere hoodie, such as this one (that I've previously styled here) with trainers such as these. Or another way of styling them is how I've done below with a cashmere crew neck & some leopard print. I wanted these trousers to be slightly cropped on me so I ordered the shorter length in a size 6 & the fit is perfect (I'm 5'7" & generally a UK 8). A statement dress also makes my top 10 wardrobe 'must haves'. Now leopard print has been huge this season & it's not going to go anywhere fast, in fact for fellow 'Bet' lovers like myself it's a classic & a neutral. 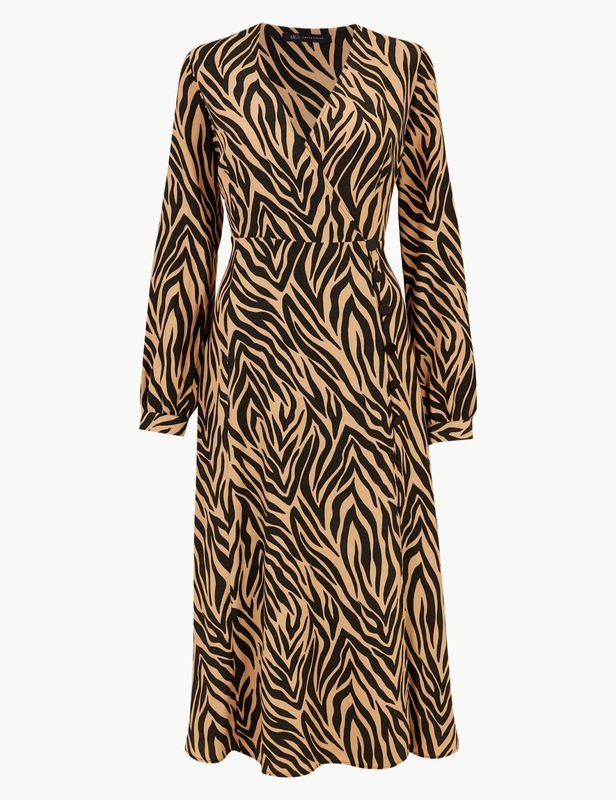 As well as leopard print & snake print there's also a lot of zebra/tiger print coming through so this midi wrap dress is perfect for creating a statement. Dress up with heeled ankle boots like these with a blazer, such as this one. Or dress down with a biker jacket, such as this one & trainers, like these. As you can see from the above & below pictures I chose to style mine with some heeled ankle boots & wide waist belt. I'm wearing a size 8 in the dress & whilst the dress is a 'wrap' style it actually fastens with buttons to the side, which is a lovely bit of extra detailing. The final item to make my top ten is of course a pleated midi skirt, one of my favourite items to wear. 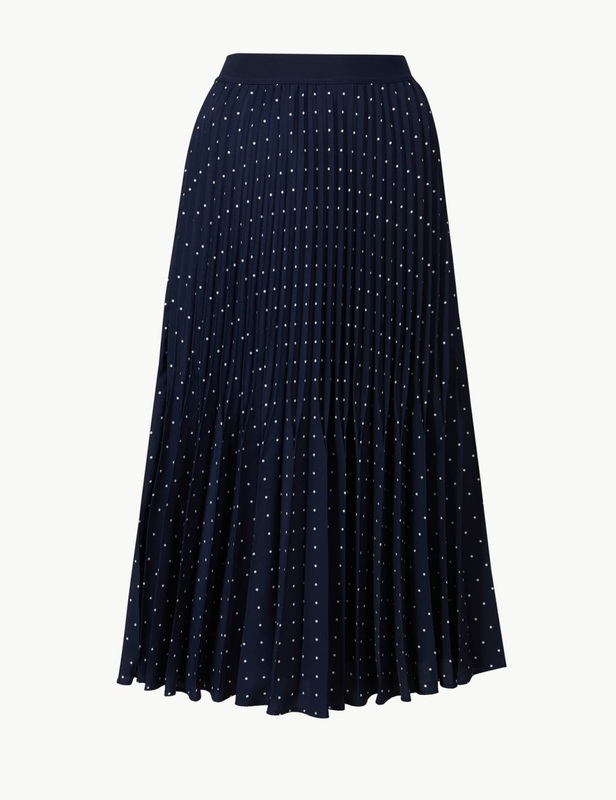 Dress up or down, I love wearing this type of skirt with a biker jacket, such as this navy one, a simple cashmere crew neck, like this one & trainers similar to these. Plus who doesn't love an elasticated waist, especially when it means you can size down (I'm wearing a UK 6 & am wearing the skirt more on my hips for a longer look). I have to say the skirt falls beautifully, partly due to the small pleats at the top & also due to the lining. It's a real swish factor skirt that will prove extremely useful & is gorgeous to wear. As you can see below as well as dressing down, it also looks great dressed up slightly with an off the shoulder knit & navy ankle boots & of course my beloved pop of red! So ladies that's my top ten wardrobe 'must haves' but what would be in yours? Don't forget you can check out Marks' full new into store collection here. Have a great Wednesday & I'll see you tomorrow. This post was written in collaboraion with Marks & Spencer. I like the wrap dress Jane, I'm keen to try it on. Unfortunately the pleated skirts are not a good look on my hips. Ooh let me know what you think. I love the button detailing & think it will be a really useful dress for dressing up & down.